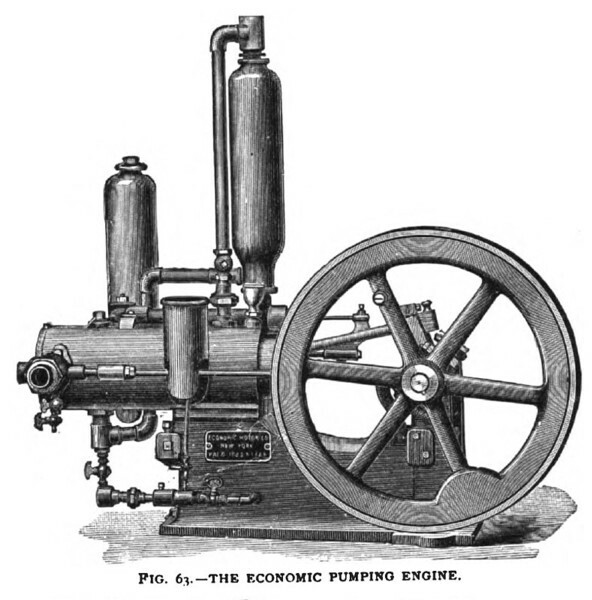 Many of the engines of the Economic Gas Engine Company are still in use. We illustrate their design as being one of the earlier types in use in the United States. It is of the two-cycle non-compression type of Lenoir, with an indicator card of the form shown in Fig. 3. 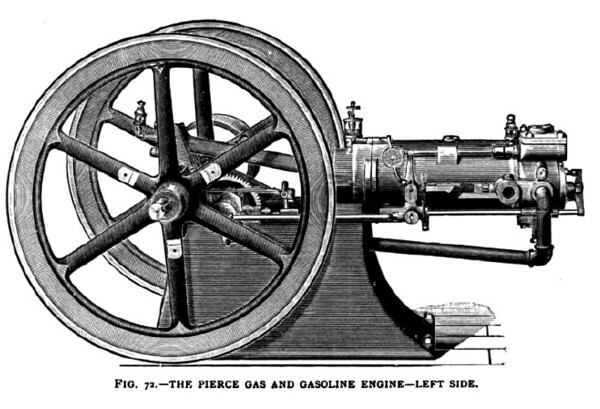 A section of this engine is shown in Fig. 62, in which A is the jacketed cylinder, D the piston with an elongated shell D', F air and gas inlet and mixer, J a check valve; c and c' mixed gas and air ports, d auxiliary air port; g' piston exhaust valve with exhaust port f, b a deflector and a' firing port. The operation is as follows: The piston sweeps the products of a previous combustion out at the exhaust port by the piston following to a point when the inlet ports in the piston are just past the inlet ports in the cylinder, when the exhaust port closes and the suction of a charge commences and is continued until the inlet ports are closed by the outward stroke of the piston. At this point the firing ports of cylinder and piston are in line and the explosion takes place with all the ports closed to the end of the impulse stroke, when the exhaust port opens by a cam and the products of combustion are again swept out with the exception of the clearance space within the shell of the piston. This engine, like others of its type made in Europe, is not considered economical as compared with the later engines of the four-cycle compression type. The various designs as made by different makers consume from 80 to 50 cubic feet of illuminating gas per horse-power hour, the latter figure being the rate for the Economic as made ten years since. The New Era Gas Engine is of the four-cycle compression type with a heavy and substantial base. The valve-gear shaft being driven by a worm gear from the main shaft, insures a smooth and noiseless motion. The illustration (Fig. 66) on this page has one of the fly-wheels left off to show the arrangement of the worm gear, which is also shown in Fig. 67 in detail. This method of driving the valve-year shaft is fast growing in favor, and is now largely in use. The valves are of the poppet type, operated by cams on the secondary shaft, which also drives the governor through bevel-speed gear. All the valve chambers have flanged plugs for facilitating the removal and cleansing of the valves. The end view of the lateral shaft and valve chest with the attachment of the tube igniter is shown in Fig. 68. The electric igniter is applied at the same opening in the valve chest as used for the tube igniter. 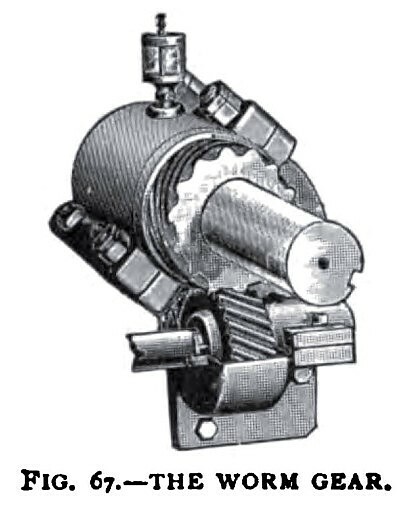 The governor is of the ball type, running direct from the secondary shaft by a bevel gear, and through a bell-crank lever and arm controls the gas-inlet valve. Fig. 69 shows the arrangement more in detail and also the great convenience in gas engines, a cap plug for quickly removing the valve and an inspection plug at the side of the valve chest. The fuel for these engines may be illuminating gas, producer gas, natural gas, or gasoline. The cost for running can be gauged only by the quantity, say 15 to 20 cubic feet illuminating gas or one-tenth of a gallon of gasoline per indicated horse-power per hour. 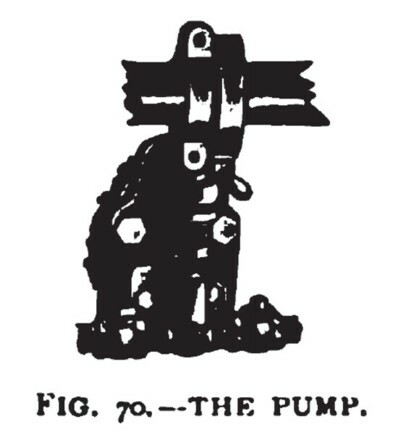 In using gasoline a small pump (Fig. 70) is attached to the engine bed and driven by a cam on the lateral shaft. The pump draws from a tank set in a safe place, underground if possible and draws a few drops of gasoline at a stroke, forcing it into the air chamber, where it is vaporized and mixed with the incoming air. The surplus, if any, is returned to the tank. These engines are made in sizes from 10 to 50 B. H. P.
This engine is built on the four-cycle compression type, as shown in the illustrations of both sides of the 1 to 5 H. P. engines (Figs. 71 and 72). This company also build engines of 6, 8, 10, 12, 15 and 20 H.P. These figures represent the brake or actual horse-power. The valve motion is taken from the main shaft with spur gears and secondary shaft upon which there is a cam that operates the valves through a connecting rod. On the face of the cam is a wrist pin, carrying a connecting rod, which operates both the governor and the electrical firing device. The poppet valves never require oil; they lift squarely from their seats. They wear- smooth and bright and are easily uncovered for regrinding when necessary. The entire operating mechanism is in plain sight and all wearing parts can be readily examined and adjusted without removing or taking the engine apart. The governor is very simple and sensitive. It is composed of three pieces: a hardened steel finger, weighted and held to its proper position by an adjustable spring. The weighted finger acts as an inverted pendulum swung by the movement of the connecting rod, making a miss gas charge when the engine speed is too high. It is adjustable by moving the weight on the stem and by a spiral spring and adjusting nut. These engines are built to run with coal gas, natural gas, and gasoline, can be changed from one fuel to another with little trouble, and are also made to change while the engine is running. The electrical firing device is very simple. It is composed of two electrodes, one a flat piece of steel 1/4 inch wide by 5/8 inch long and 1/16 inch thick. The other is a piece of No. 16 wire. One is insulated from the engine and the other in circuit with it. A make-and-break spring at the side of engine (also insulated from the frame) forms the circuit when the electrodes come together. In parting the spark is made which fires the charge. The electrodes never corrode, as they clean themselves every time they pass each other, and they will remain clean until they are worn out. A four-cell battery is used and will run these engines 1,800 hours without recharging. Cost of Operation—These engines run with a consumption of illuminating gas of 16 cubic feet per actual horse-power per hour; with gasoline, 1/10 of a gallon per actual horse-power per hour. For the use of gasoline, a small pump is attached to the engine, which pumps the gasoline to a small cup from a tank placed underground or in a safe place; from the cup the gasoline is fed directly to the cylinder air inlet. If more gasoline is pumped than required, the excess runs back to the tank; 0. 74 gravity gasoline is used. 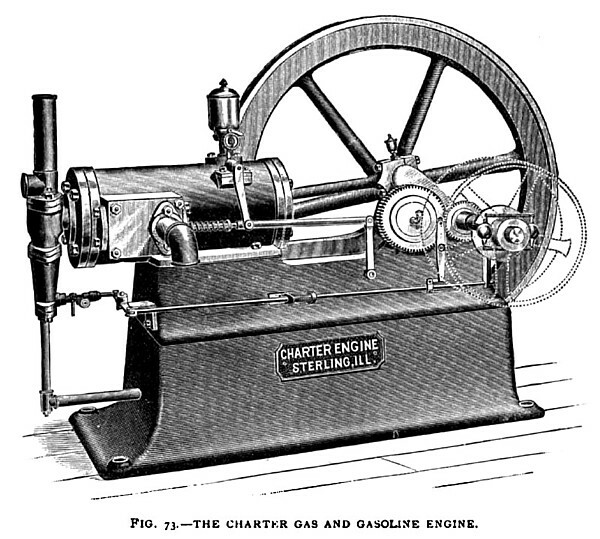 The Charter is a representative of one of the earliest types of American gas engines. It has gone through its evolution of improvement, and claims to be a model of simplicity. It is of the four-cycle compression type. It runs equally well with illuminating gas, natural gas, and gasoline. It is built in nine sizes, from 1¼ to 35 B. H. P. The cut (Fig. 73) represents five sizes, and Fig. 74 represents the smallest size, No. 00, which is vertical and of 1¼ B. H. P. Both tube and electric ignition are used with these engines. 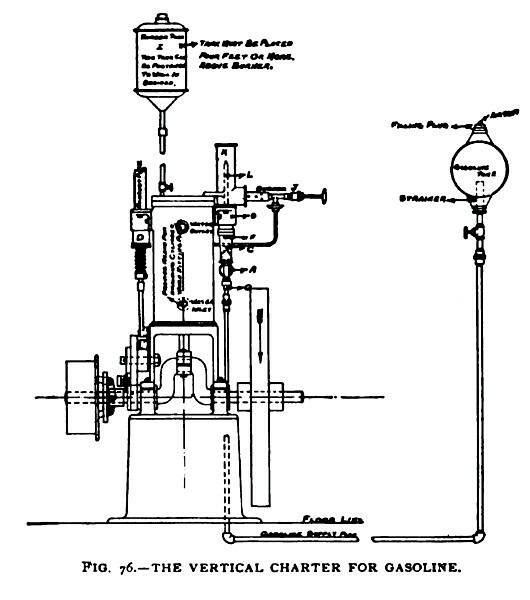 In the horizontal engine the mixing chamber is attached to the head of the cylinder, into which the gas or gasoline is injected by the operation of the small pump G (Fig. 75), driven by a rod and levers operated by a cam on the secondary shaft. The nozzle H (Fig. 75) projects upward so that the indraught from the air pipe N supplies the required quantity, while the overplus is returned to the tank when placed below the engine. 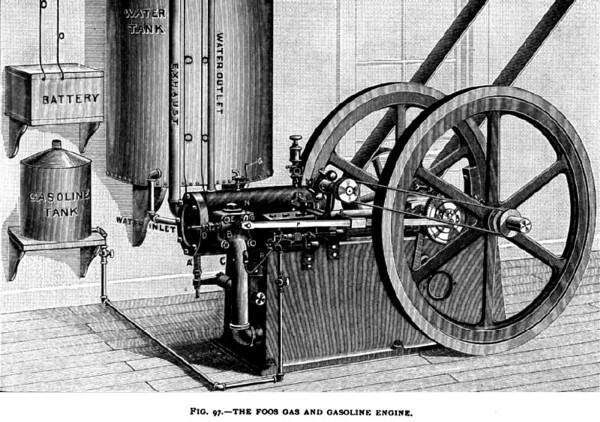 When the gasoline tank is placed above the engine so that there is a gravity flow to the engine, the flow is regulated by two valves in the flow pipe, a throttle valve at the pump, and by the operation of the plunger of the pump, which in this case does not force a specific quantity of gasoline, but only opens the way for an instant of time to a flow produced by gravity and the suction of the cylinder. 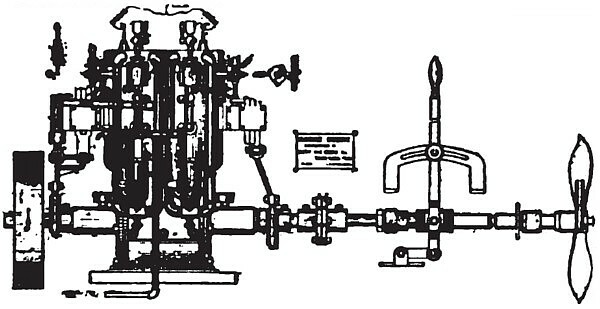 In this arrangement, any stoppage of the engine other than by closing the gasoline valves will stop the flow of gasoline by the covering of the pump ports by the plunger. The governor is of the centrifugal type, mounted on the pulley, and consists of two balls held in tension by springs, which operate a sleeve on the main shaft through a bell-crank movement. The movement of the sleeve throws the injector-rod roller on to or off the cam on the secondary shaft, thus making a "hit or miss" injection from the pump. 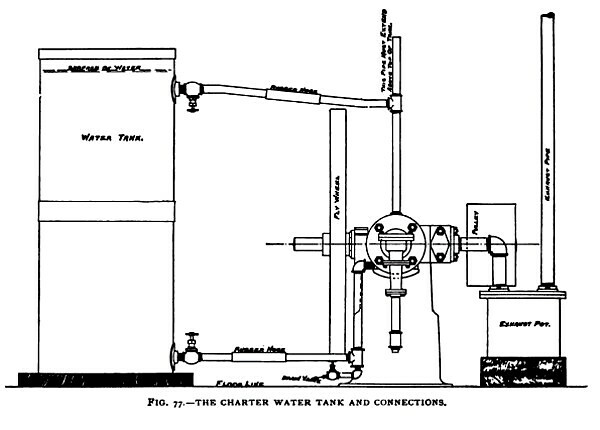 Communication between the mixing chamber and the cylinder is cut off, at the moment the charge to the cylinder is completed and compression commenced, by a gravity-poppet valve at B (Fig. 75). The operation of the pump plunger is the same for gas as for gasoline: the plunger only opening a way for the flow of the gas at the proper moment, and being governed in its operation the same as when gasoline is used. The exhaust valve is of the poppet type, operated by a cam on the secondary shaft, the movement of which also operates the oil cup on the cylinder by the levers and small-rock shaft, as shown in Fig. 75. The detail of the operating parts are well shown in the skeleton cuts of the horizontal and vertical engines (Fig. 76 and Fig. 77). A relief valve for easy starting is placed on the cylinder of No. 2 and larger engines. The No. 6 and No. 7 engines are furnished with a perfect and practical starter. The ignition-tube burner is shown in the different illustrations, consisting of a gas or gasoline jet in a perforated sleeve, acting as a Bunsen burner upon the compression tube contained in the asbestos-lined chimney. For electric ignition a pair of insulated electrodes in a plug are screwed into the place of the tube igniter and operated by a spark breaker. Fig. 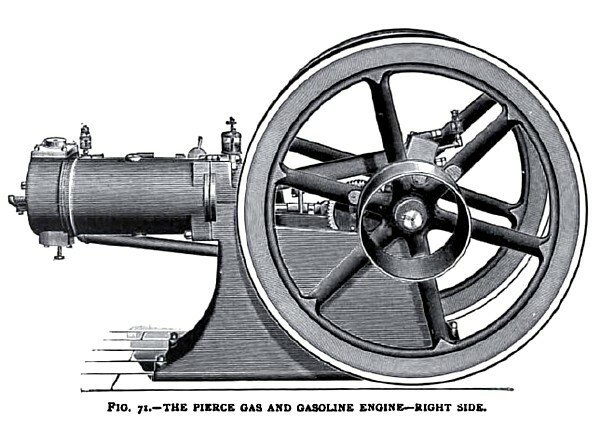 79 shows an engraving of the Charter gasoline engine and pump combined. This combination was designed for any kind of service that piston pumps are capable of. It is compactly built, a feature, which, in places where floor space is valuable, is especially desirable. It is easily operated. When through pumping, nothing remains to do but shut off the gasoline. As no special attendant is required, it is especially desirable for filling railroad tanks, as the station agent or his assistant can take care of the engine and see that the pumping is done without interfering with their regular duties, thus saving the expense of employing a man to go from station to station to fill the tanks. It is a suitable pumping engine for hydraulic elevators. The. gears are all machine cut, the pump cylinder is brass lined, and everything about the engine and pump is built on the interchangeable plan. 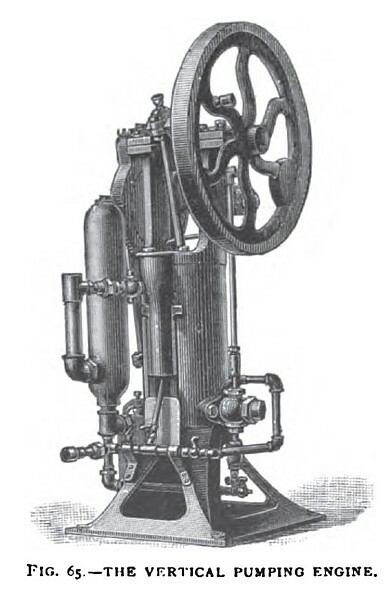 The cut illustrates an engine and pump capable of delivering 60 gallons of water per minute against 100 or 200 feet head, or equivalent pressure. It is self-contained and may be set in operation almost anywhere. The pump gear is easily detached and a pulley supplied for temporary power use, making this combination a valuable one for agricultural work and irrigation. These engines are built in three styles, all in the vertical four-cycle compression type. 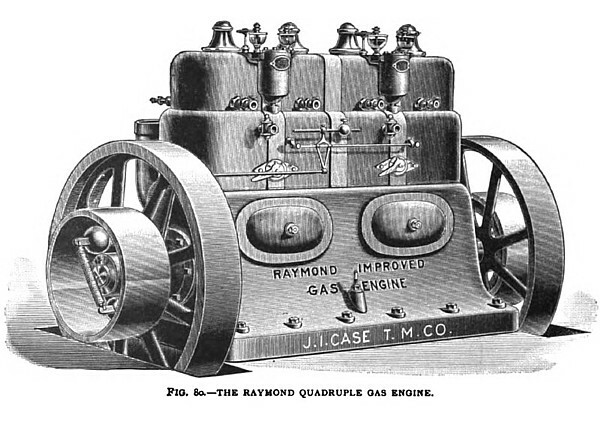 The quadruple compression engine (Fig. 80), in which there are two impulses during each revolution of the shaft, are made in three sizes: 60, 85, and 100 H. P. (actual). The duplex (Fig. 81) with a section view (Fig. 82), in which one impulse is made for each revolution, are made in ten sizes, from 4 to 50 H. P. (actual). The details of construction are similar in all the styles and sizes. They are entirely enclosed in a base with a vent pipe at the back to prevent cushioning by the pistons, and, with the large flange on the front of the base, are removable for easy feed-oil access to the moving parts within. The valves are of the rotating- type and are operated directly from the crank shaft by a set of bevel and spur gear; they are held to their seats by spiral spring's and are supplied with steel ball bearings. The valves are lubricated from sight feed oil-cups. Fig. 82 shows a section of one of the cylinders of a duplex with the bevel gear, secondary shaft, and spur wheels of the valve gear. The governor is placed on the fly-wheels, and is of the centrifugal type, and regulates through piston valves the exact amount of gas or gasoline mixture required for each impulse to maintain a perfectly steady speed of engine under all conditions and variations of load. For the use of gasoline, naphtha, or light petroleum oil, a glass reservoir is placed on top of the vaporizer of the capacity of a half-pint, which is connected to a small pump, which in turn is connected to a gasoline tank. A return pipe connects the reservoir with the tank for return of the surplus gasoline. The adjustable needle valve, which governs the supply of gasoline necessary to give the engine its required power and steady motion, is in direct connection with the shaft governor and works automatically. The hot and cold air valve, or air mixer, connects the vaporizer with a jacket around the exhaust pipe, in which the air is heated to more effectually vaporize the gasoline. An explosive starter is provided for the large engines. Fig. 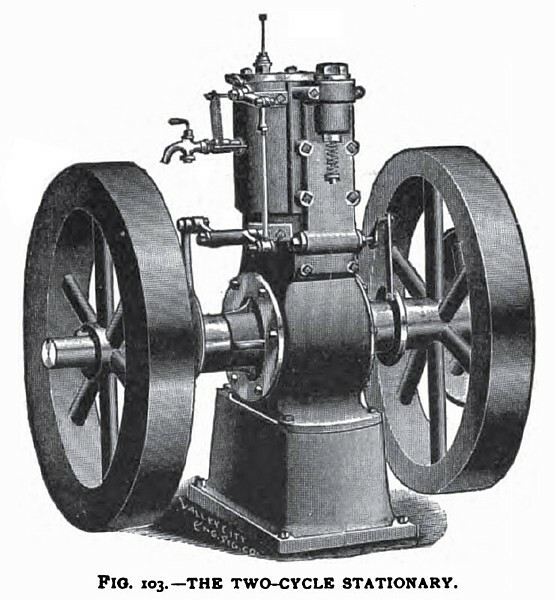 83 illustrates the Raymond single cylinder engine for gas, gasoline, or light oil, showing the cover removed to expose the valve gear and adjustable spring for tightening the rotating valve. It is made in ten sizes, from 1 H. P. (actual) to 20 H. P. (actual). It is claimed that an economy of 12 cubic feet of natural gas per actual horse-power has been attained, and a guaranty of 15 cubic feet per actual horse-power is made. 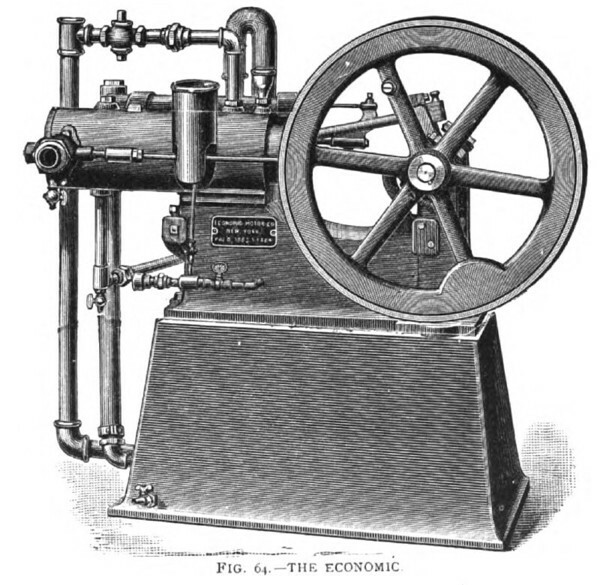 This engine is of the two-cycle compression type, taking an impulse at every revolution, yet it is different from the usual action of the ordinary two-cycle non-compression type, for it is a compression engine with enclosed crank and piston connections, so that with the up-stroke of the piston air is drawn into the crank casing and by the return stroke the air is slightly compressed. 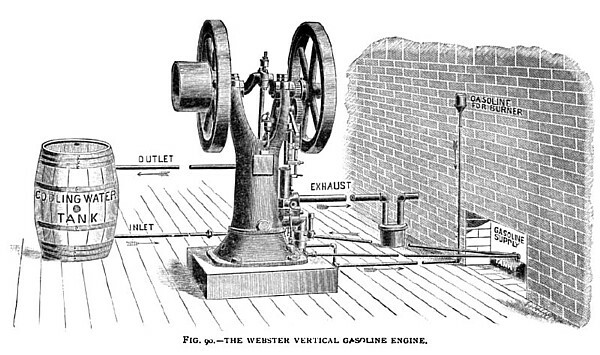 When the down-stroke of the piston nears the terminal, it opens an exhaust port in one side of the cylinder, and at a little farther advance of the piston opens an inlet port on the other side of the cylinder, through which the compressed air in the crank chamber rushes to charge the cylinder, at the same time the gas valve is opened by the eccentric; or if gasoline is used, the pump injects a charge of gasoline in a fine spray at the proper moment. By means of a deflector on the inlet side of the piston, the incoming charge is thrown upward toward the top of the cylinder, thus separating the discharging products of the previous explosion from the fresh charge and by this means obtaining a purer mixture for the next explosion. The ascension of the piston gives a full compression and time for the mixture to become uniform for ignition by tube or electric igniter. It may be called a valve-less engine, as the piston itself opens both the exhaust and inlet ports. A light check valve only is used to check the return of the air drawn into the crank chamber by the upward movement of the piston. In Fig. 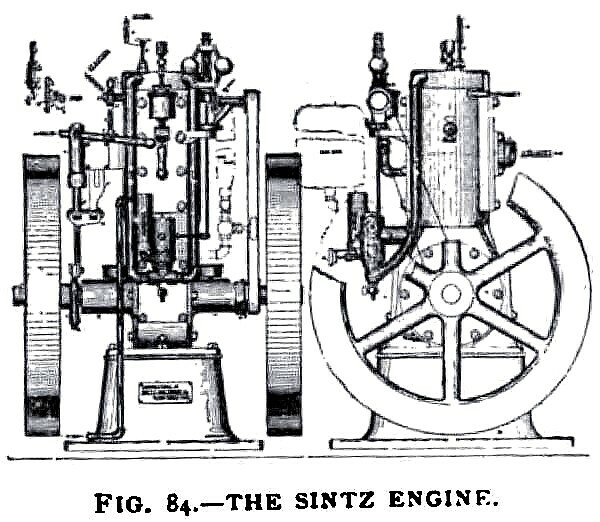 84 is represented the stationary Sintz engine, front and side view. The governor is of the centrifugal type, located in the fly-wheel, where two balls held by springs operate through bell-cranks the movement of a sleeve on the main shaft carrying a cam, which by the position of the sleeve determines the operation of the cam on the gas valve, or on the gasoline pump when gasoline is used. The cam is so constructed as to regulate the flow of gas or gasoline to modify the explosive mixture, and not by the entire suspension of an explosion. Fig. 85 shows the duplex marine engine with its reversing propeller. 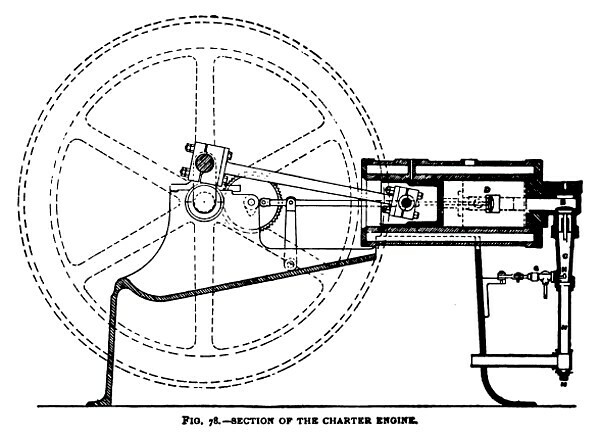 The reversing gear operated by the lever contains all the movements required for full head, slowing, dead centre, slow backing, and full back—one of the neatest arrangements yet made for the management of boats driven by gas engines. Other arrangements of the reversing lever are made so as to place it in the forward part of the boat with the steering gear. A section of the Sintz cylinder (Fig. 86) shows somewhat in detail the inlet and exhaust ports with the deflector on the piston opposite the inlet port. The compressed air port in a recess in the lower part of the cylinder shuts off a portion of the compressed air at the moment that the inlet port opens, by which means a measured charge of fresh air is forced into the cylinder at every revolution of the shaft. The slight compression by the down-stroke of the piston is sufficient to charge the air chamber in the cylinder for an explosion charge by its expansion through the inlet port during the part of the crank revolution due to the amount of port opening. The electrode entering at the top through the cylinder cover makes contact and spark break by the rocking arm on a spindle passing through the side of the cylinder. The time regulation is adjusted by the insulated screw electrode, while the break arm is operated by a connecting rod from the pump arm; both pump and breaker are operated by one cam. 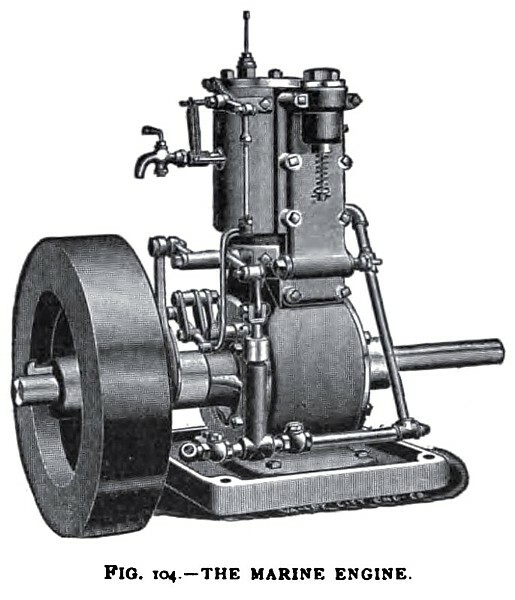 In the gasoline stationary engines the required quantity of gasoline is regulated by a needle valve operated by the governor, while in the marine engines, the needle valve is operated by a rod extending to the steering wheel. With the extension of the reversing-gear connection to the steering wheel forward, all the operations for running a boat are managed by one person. 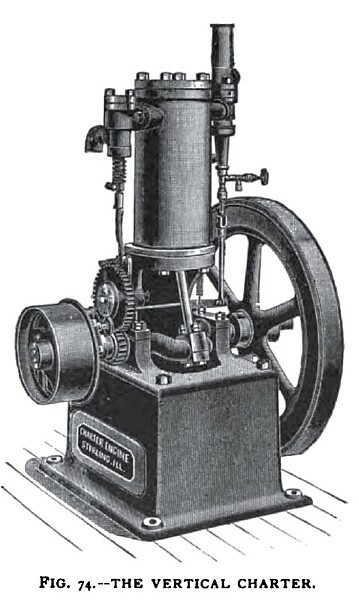 This unique motor, first brought out in England, and made in the United States by the Warden Manufacturing Company, is of the two-cycle type, in which compression, expansion by combustion, exhaust, and recharging are accomplished by the motion of the piston during each revolution arc produced by a toggle-joint movement across the centre line of the engine. Its cyclical recurrence is seemingly a near approach to an ideal motor from the fact that the clearance is small in proportion to the volume in the fresh charge, and therefore the explosive effect is much greater than in motors of the four-cycle type. Fig. 87 shows a perspective view of the engine, and Fig. 88 is a sectional elevation showing the movement of the toggle connection in producing the four distinct movements of the piston for each revolution of the shaft. 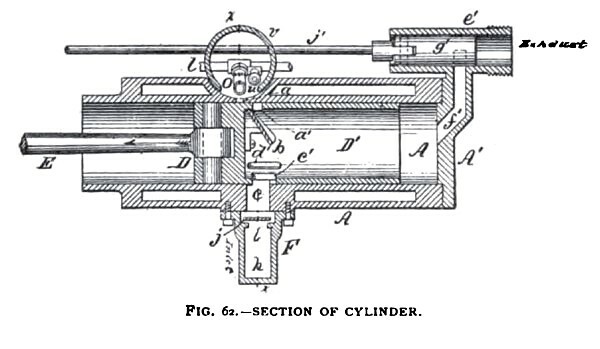 It will be noticed by a careful inspection of the sectional elevation that the different operations are obtained by the addition of but two parts, a link, which vibrates through the arc of a circle, a connecting rod, and by changing the position of the crank shaft in relation to the cylinder. The outer end of the piston connecting rod is attached to a pin passing through the crank connecting rod, and the latter is connected to the link. The different centres are so placed in relation to each other and to the centre line of the cylinder that the centre of the pin to which the piston connecting rod is attached travels in a curve resembling the figure eight, passing over the portion SC (Fig. 88) during the suction stroke, over CW during the compression stroke, over WE during the working or explosive stroke, and over ES during the exhaust stroke. 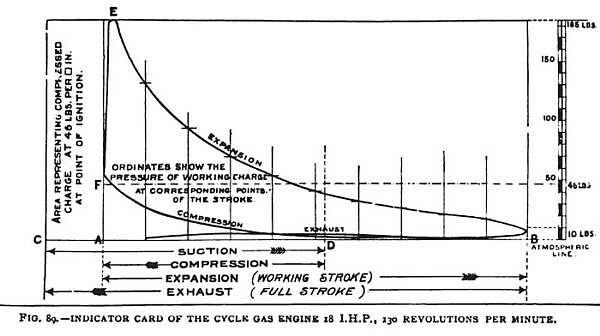 The figure shows that the compression stroke is shorter than the suction stroke, that the working stroke is almost double the suction stroke, that the exhaust stroke ends with the piston as close to the cylinder cover as it is possible mechanically to have it, and that the working stroke takes place in one-quarter of a revolution. The clearance space beyond the terminal exhaust position of the piston is so small that practically the products of combustion are entirely swept out of the cylinder during the exhaust stroke, so that each incoming charge has the full explosive strength due to the mixture used. It is also possible to expand the exploded charge to such a volume that the terminal pressure will be reduced to the lowest practical point, and that, owing to the purity of the charge, the greatest possible pressure will be attained at the commencement of the expansion. In Fig. 89 is represented an indicator card taken from an 18 H. P. engine. It is a most interesting study and shows the value of a pure mixture in the quick and sharp terminal of the explosive effect, occupying only about 0.09 of a second in duration and a pressure of 185 lbs. per square inch, with the expansion line falling in good form to 10 lbs. at the exhaust end. — the mean pressure being 49 lbs., which is equal to about 80 lbs. mean pressure in a four-cycle engine, considering the difference in idle piston travel and comparative proportion of expansion stroke. These engines as are now made are improvements on the Lewis engine as formerly made. Fig. 90 represents the vertical gas and gasoline engine, with its connections with the gasoline supply, cooling tank, and muffler. The gasoline for the burner runs by gravity from a small tank on the wall. The vertical engines are made of 2 H. P. for power and pumping. In Fig. 91 is represented the horizontal gasoline engine of this company. It is of the compression four-cycle type, with poppet valves, tube igniter, gasoline pump, and regulating valves for both gasoline and air inlet, independent of the governor, which is of the centrifugal ball type, attached to the main shaft, and operates a regulating cam. 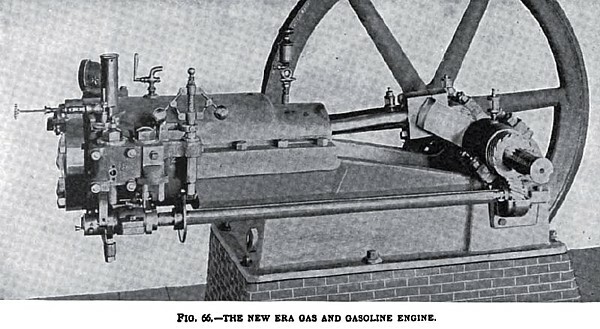 The reducing gear from the main shaft, through a secondary shaft, operates the exhaust valve and gasoline pump through the lever across the front of the bed piece. In operation, the air charge is drawn in through the pipe and regulator valve from the hollow bed piece and vaporizing chamber to the valve chest, the inlet valve opening by the suction of the piston. When running light the governor shaft causes the exhaust valve to miss its lift, as also the gasoline pump to miss its stroke, and thus the gasoline supply is cut off until released by the governor. A small lever serves to open the exhaust valve and relieve the pressure in starting the engine. A self-starting mechanism is furnished for the larger size engines, a novel and simple arrangement, consisting of a valve screwed into the top of the cylinder, in which is inserted an ordinary explosive match. 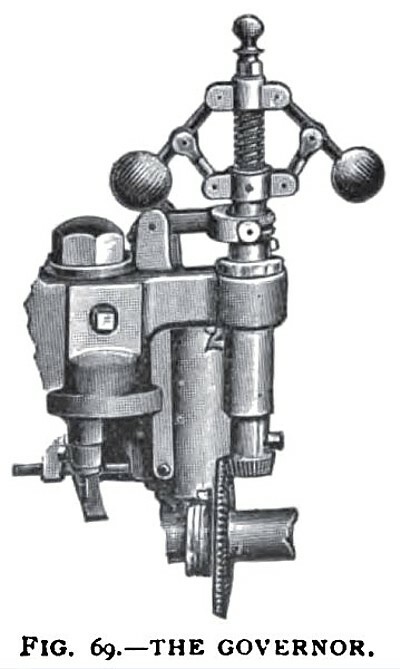 By screwing the valve disc down to make tight, the head of the match comes in contact with the seat of the valve, which produces a flash and thus ignites the charge, which has been slightly compressed by turning back the fly-wheel with one hand, while with the other hand the operator turns the valve to its seat. The sizes of engines made by this company are of 4, 6½, 10, 15, and 20 B. H. P., and adapted for the use of gas, natural gas, and gasoline. 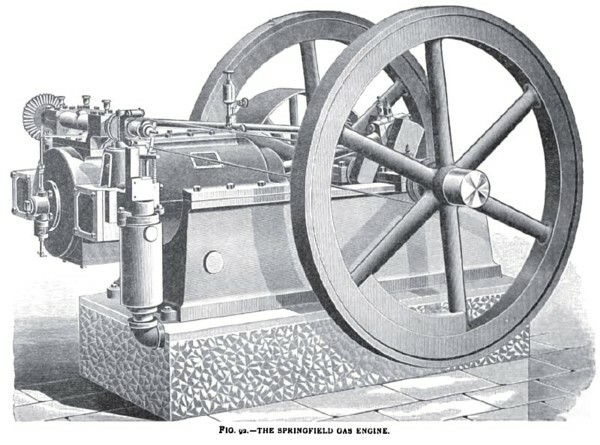 The engines of the Springfield Gas Engine Company are of the four-cycle compression type, adapted to the use of illuminating gas, natural gas, producer gas, gasoline gas, and gasoline fluid by injection. The inlet and exhaust valves are of the poppet type, actuated by cams on a cross shaft over the cylinder head, the cross shaft being driven by a longitudinal shaft and two pairs of bevel gears. The cams Nos. 18 and 19 on the cross shaft (Fig. 93) operate the inlet and exhaust valves by depression against internal pressure, the valves being also held to their seats by springs. The governor is of the horizontal, centrifugal type, running free on the end of the cross shaft and driven by a small belt from the main shaft. Fig. 93 shows an end view of the engine as fitted for gas. An air valve No. 8 and the gas valve No. 35 are on a vertical spindle, which is operated by a cam, rotating with the cross shaft and controlled in its longitudinal motion by the governor, making an off-and-on charge. The portion of air charge is fixed by the set of the air valve, and the proportion of the gas charge is regulated by adjustment of the gas valve, which is set by raising or lowering the gas-inlet pipe No. 6 in the mixer No. 10 by means of the set-screws No. 7. For the use of gasoline a small supply pump, driven from a cam on the longitudinal shaft, supplies the fluid to the injection plunger with an overflow to return the surplus to the gasoline tank. Fig. 94 is a side view of the engine as arranged for controlling the fluid injection. The air-inlet pipe is attached to the side of the mixing tank; the gasoline pipe from the supply pump enters at No. 72. No. 56 is the injector plunger, and No. 57 the air-valve stem. With a gravity feed the supply pump is dispensed with. Electric ignition is used. The device is embodied in a flanged chamber bolted to the head of the cylinder, as shown in Figs. 93 and 94, and the construction is detailed in Fig. 95. The upper electrode No. 34 vibrates as a current breaker, and is operated by a snap cam and spring lever at No. 20 in Fig. 93, The lower electrode is insulated and has a screw movement for adjusting the separation of the electrodes. 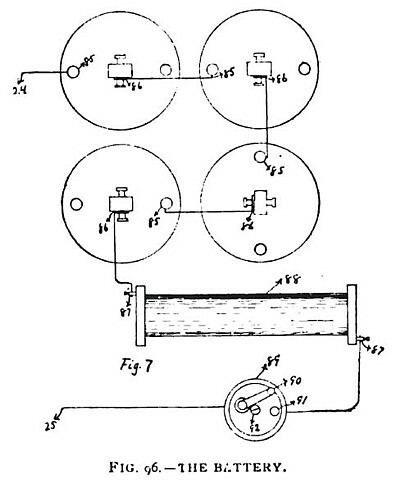 The battery connections are made on the head of the cylinder at the binding post 82, and to the insulated electrode at 25. The battery plant consists of four (more or less) Edison-Lelande cells in series, a sparking-coil, and switch, as shown in Fig. 96. The sparking-coil is more fully described on page 75, in the chapter on ignition devices. The switch should always be turned off when the engine is not running, to save battery waste. 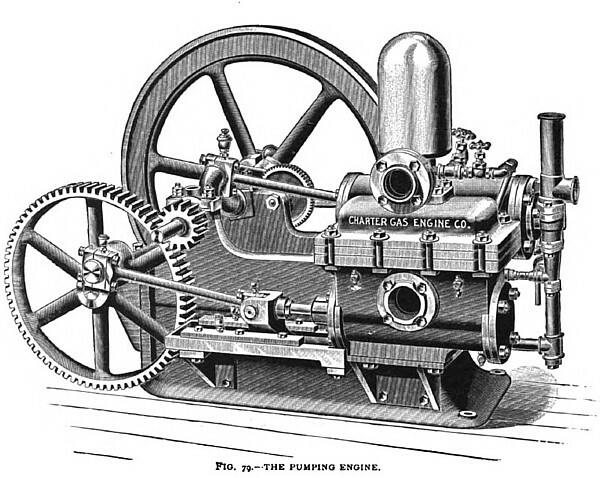 The Springfield Gas Engine Company builds eleven sizes of gas and gasoline engines, from 1 to 40 B. H. P. Full details for running these engines, with reference and key to the parts as figured, are given in their book of instructions. 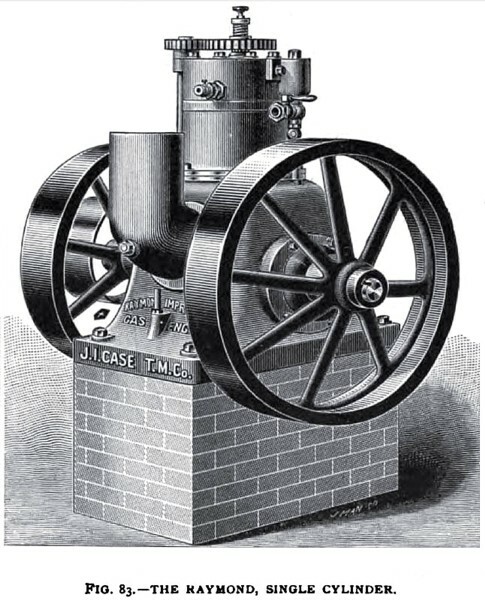 The engines of the Foos Company are built in the horizontal and vertical style, and of 16 sizes from 2½ to 100 B. H. P.
They are all of the four-cycle compression type, with poppet valves. Fig. 97 represents the horizontal engine as connected for the use of gasoline. 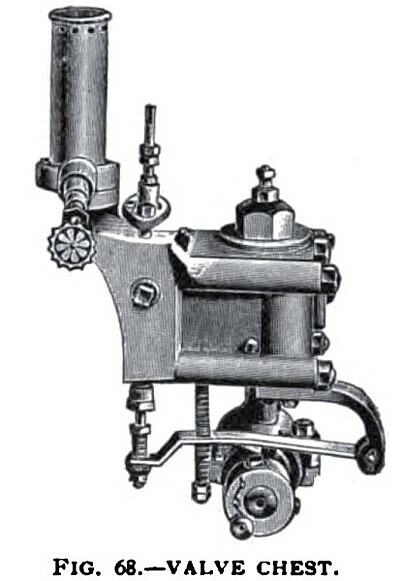 The exhaust valve on the opposite side of the cylinder in the cut is lifted by a rock shaft and arms operated by a connecting-rod inside of the engine base, leading to a cam on the reducing-gear. The adjustable spring closes the exhaust valve. The regulation is made by mischarges of gas or gasoline by an interrupter device on the charge push-rod leading from a cam on the secondary gear. The governor L is of the horizontal centrifugal type, driven by a band from a pulley on the main shaft. The movement of the governor operates a lever, which makes a hit-or-miss contact between the push rod and the pump rod, as may be traced by inspection of the cut (Fig. 97). When gas is used, the pump is removed and a lever attachment made in place of the pump rod, which operates a gas valve for intermittent discharges into the air-inlet pipe, in the same manner that the gasoline injection is made, and controlled in the same way. The charging and exploding chamber is shown at B (Fig. 97), and the details of its operation are shown in Fig. 98. The air is drawn in by the suction of the piston through the valve shown at X Y, the spindle of which passes through a sub-chamber connecting with the air pipe, and is regulated in its tension by a spiral spring and adjusting nut. 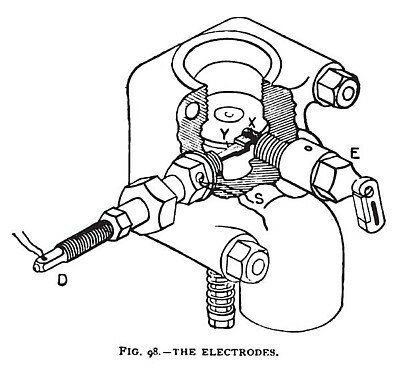 The electrodes are shown at D and E, D being an insulated spring with its battery connection at D, and the opposite electrode is connected to the plug at S. The electrode E is revolved by the oscillating and sliding bar F, Fig. 97, one end of which is connected to an adjustable crank pin on the secondary gear, and the other to the crank of the electrode E. The slide pivot, as observed near the middle of the bar, enables the bar to transmit a circular motion to the electrode in an opposite direction from the motion of the pin on the secondary gear wheel. The time of sparking is regulated by moving the driving-pin in its circumferential position by turning the slotted plate K, in which the pin is set. The proper moment is at the end of the forward stroke of charge compression. A relief valve G is provided for relieving the pressure in the cylinder when turning over the fly-wheel for starting. The speed of the engine may also be controlled by compressing or loosening the governor springs, by means of the nuts at each end of the springs. The electric batteries are of the Edison-Lelande type in series. 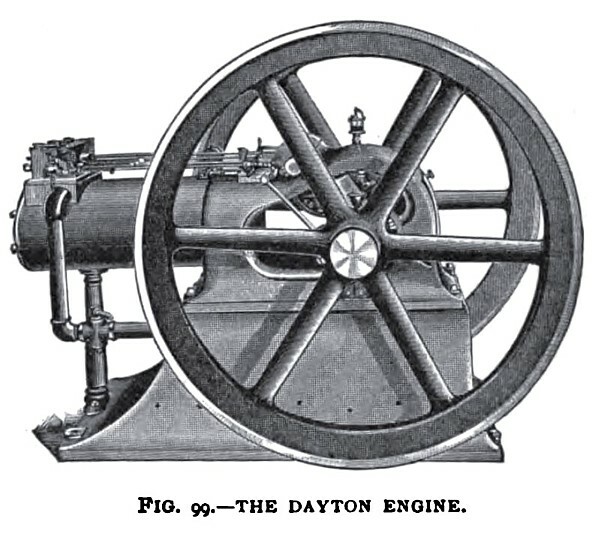 The engines of the Dayton Gas Engine and Manufacturing Company are built in the vertical and horizontal style, and also mounted as a portable engine on a wagon for agricultural purposes. They are of the four-cycle compression type, with the valve chamber on the top of the cylinder in the horizontal style, with poppet valves operated by straight-line push-rods from cams on the secondary shaft. The exhaust-valve rod with a back spring is on one side, and the admission valve with a positive cam motion and back spring is on the other side of the valve chamber, while between is the igniter rod, also operated by a cam—all having straight-line motions. The gas or gasoline valve is also operated by a rod and push-point, which is controlled by the governor. 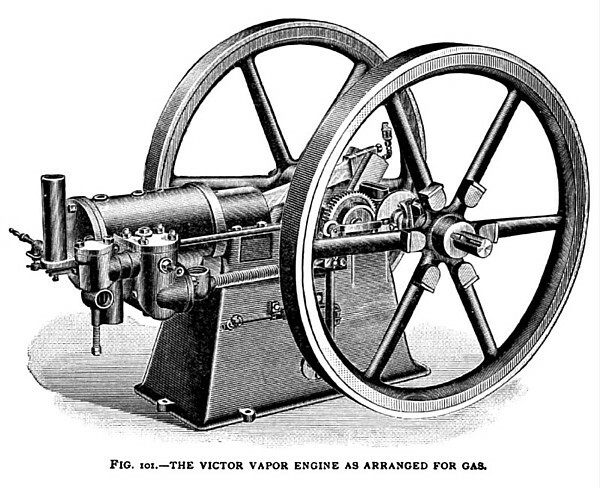 The governor is of the horizontal, centrifugal style, mounted on the main shaft, adjusted by springs, and so arranged that the engine speed is regulated by hit-and-miss charges of gas or gasoline. The ignition is electric. The spark is produced by the end of the push-rod passing an insulated stem in the mixing-chamber, and made adjustable by a movable collar and handle between spiral springs. The handle on the igniter rod allows the electrodes to be readily cleaned by vibrating the rod. The battery and sparking-coil is similar to those described with other engines. A match igniter for starting is also provided. The Dayton is built in eleven sizes, from 2 to 50 H. P., and arranged for using natural and producer gas, illuminating gas, and gasoline. 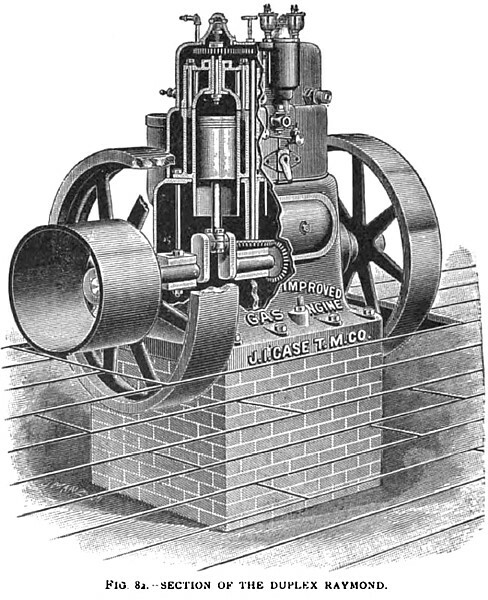 The engines of Thomas Kane & Co., are of the four-cycle compression type, with poppet valves, ignition by hot tubes or electric battery and double sparking-coil. Fig. 100 is a view of the engine as fitted for gasoline with hot-tube igniter, with one fly-wheel off to show the arrangement of the valve gear. A cam on the secondary gear drives the push-rod lever of the exhaust valve, which is held back by a spiral spring. 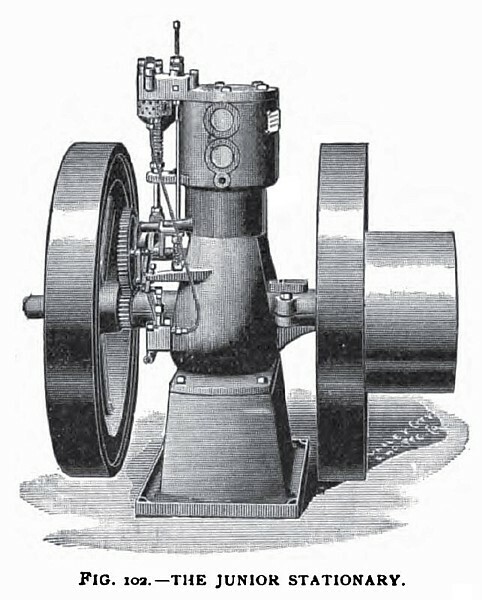 The governor is of the horizontal centrifugal type, revolving on the main shaft, and by over-speed carries the roller of the push-rod lever on to the governor eccentric, holding the exhaust valve open. The gasoline pump forces the gasoline into a small cup over the vaporizer, with an overflow back to the gasoline tank. The gasoline is fed to the vaporizer by a small valve and sight-feed cup, and comes in contact with the hot air drawn from the exhaust heater, which is a casing placed around the exhaust pipe and connected with the vaporizer by a side neck at the top of the vaporizer. Thus the gasoline coming in contact with the hot air from the heater on extended surfaces inside of the vaporizer is completely vaporized and mixed with the air to saturation before it enters the admission valve, which opens by the suction of the piston. Any accidental surplus of gasoline that may enter the vaporizer will drop into an extension of the vaporizer below the engine feed pipe, and flow back to the gasoline tank. 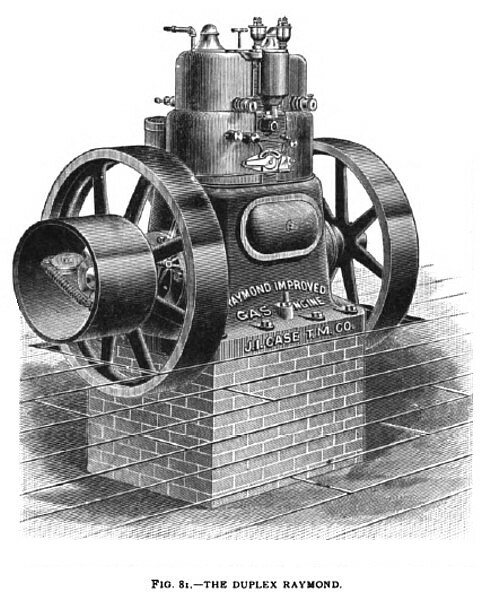 An indexed regulating valve in the vapor pipe near the admission valve serves to regulate the flow of saturated vapor to the admission valve, where it is mixed with a further portion of air drawn in by the piston to make a proper explosive mixture. The electric igniter is entered through the walls of the exhaust-valve chamber, which is directly connected with the inlet-valve chamber. 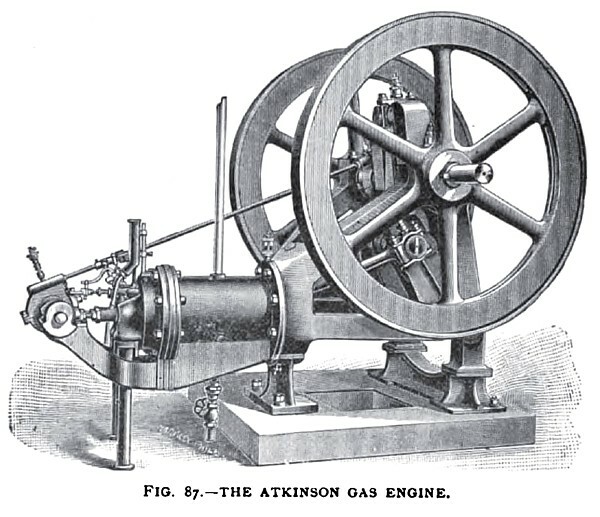 It makes a double spark by a revolving mechanism driven from the secondary gear wheel and is adjustable, so that a spark takes place, one just before and one just after final compression—this being one of the peculiar features of this engine, from which a high efficiency is claimed; the other being the thin cylinder walls, as devised by Mr. Pennington. In Fig. 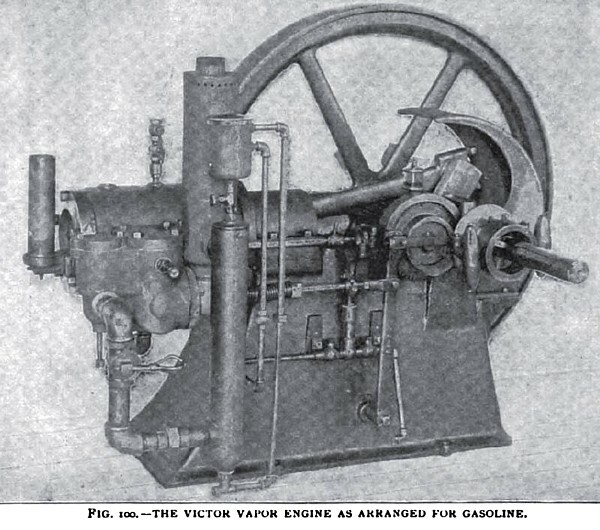 101 the same engine is shown ready for gas connection, the operation of which is the same as for gasoline, as far as the valve action and regulation is concerned. The sizes of the "Victor" are at present of 2. 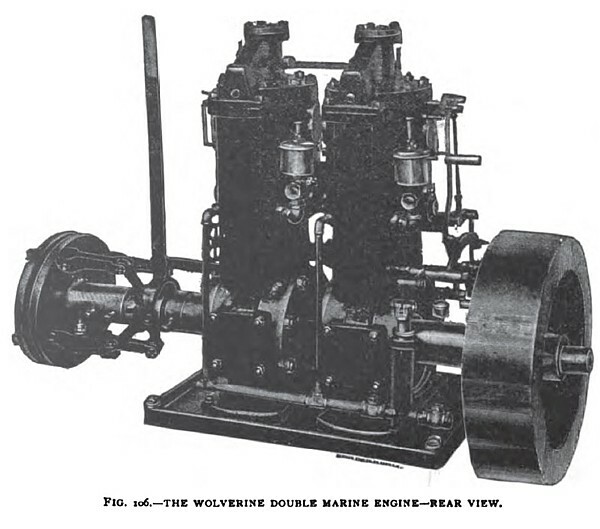 3¾, and 5 B. H. P.
The engines of the Wolverine Motor Works are in the vertical style, for both stationary and marine power, as also for car-motor service. They are of the two-cycle and four-cycle compression type, with poppet and cylinder port valves. The stationary engines are for gas or gasoline of any grade from .63 to.76 gravity. The marine engines use an injection of gasoline fluid into an air chamber, from which the vapor-and air mixture is drawn into the closed crank chamber by the upward stroke of the piston. 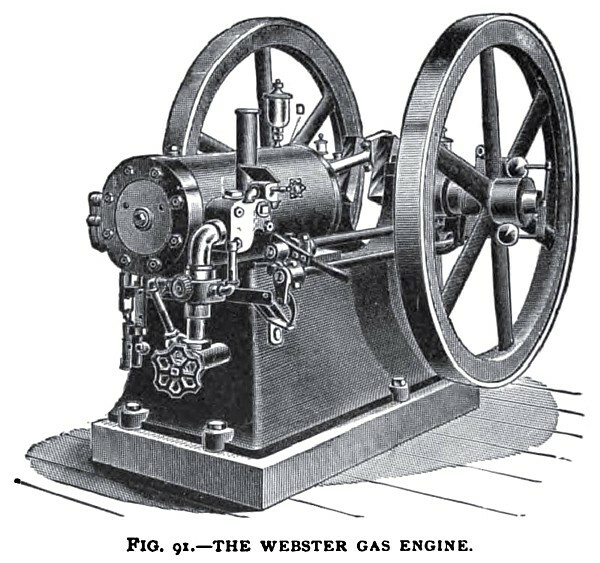 The junior stationary engine (Fig. 102) is of the four-cycle class, taking its charge of gas or gasoline by the suction of the piston, compressing by the upward stroke, and exploding by a tube or electric igniter. 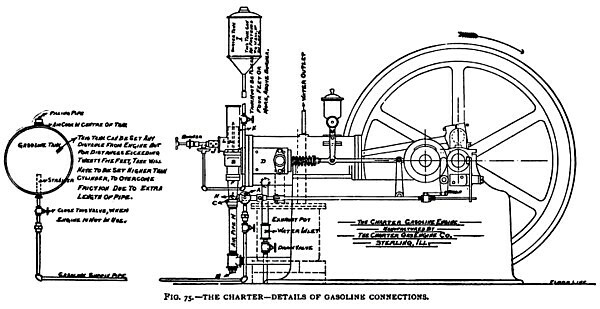 The gasoline pump as shown in the cut is operated by a bell-crank lever and roller running on an eccentric on the secondary gear. The exhaust valve is operated from a cam also on the secondary gear. The speed is controlled by a simple governor, which consists of a single bar of steel, operating by the inertia of vibration. The junior is made with single cylinders from 1 to 6 H. P., and with double cylinders of 8 and 12 H. P.
In Fig. 103 is illustrated the two-cycle stationary motor. The charging-chamber and valve are located at the upper end of the cylinder, and the exhaust ports at the lower end of the stroke in the walls of the cylinder, and are uncovered by the piston at near the end of its down-stroke. 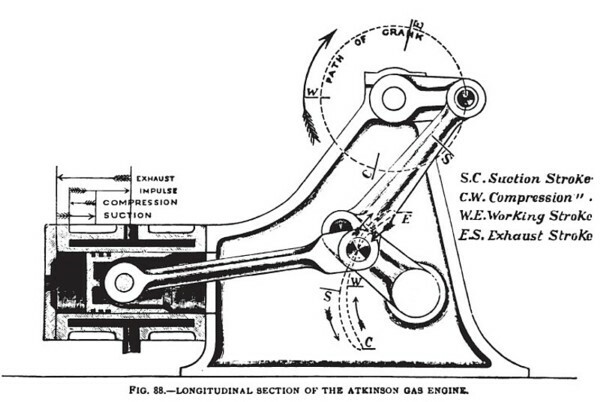 The operation is as follows: The up-stroke of the piston draws a charge of air and gas into the crank chamber of engine, the down-stroke compresses the gas slightly in the base, and when the piston is near the end of the down-stroke a port is opened in the cylinder head which permits the compressed gas in the crank chamber to pass through a passage at the side of the cylinder through the open port of the cylinder head into the upper end of the cylinder. The next up-stroke of the piston compresses the explosive gas mixture, and when the piston is near the end of the up-stroke the charge of explosive gas is exploded by an electric spark, which drives the piston down. When the piston is near the end of the down-stroke it uncovers an annular port on the side of the cylinder which permits the exhaust to escape, and immediately after the exhaust port opens, the port in the cylinder head is opened, admitting a new charge, at the same time driving the balance of the exploded charge out of the exhaust port. This is repeated at every revolution. The stationary engines are made in sizes of ¾, 1, 2, and up to 12 H.P. In Fig. 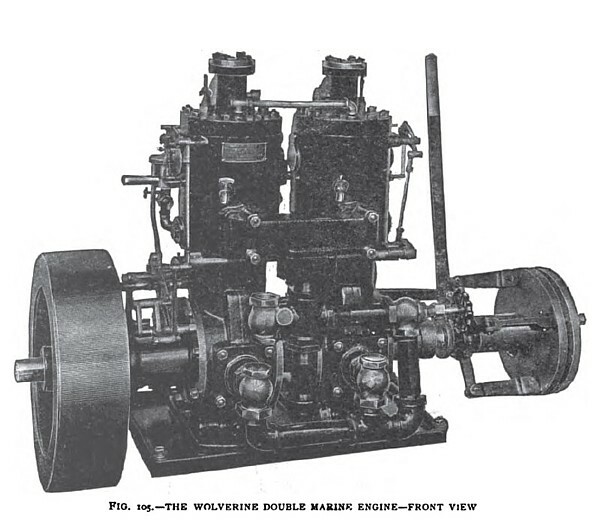 104 is illustrated the Wolverine single-cylinder marine engine. 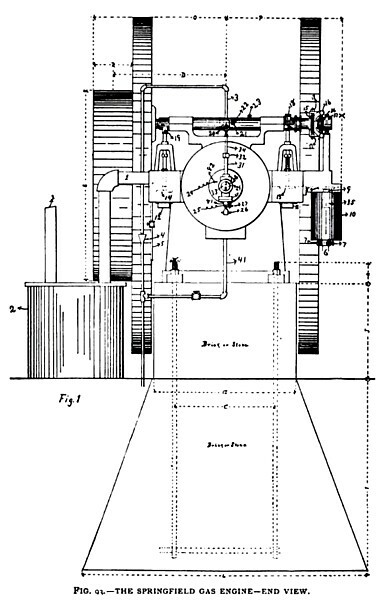 Its principles of action are the same as in the stationary engine, with the addition of a water-circulating pump driven from an eccentric, through a rock shaft; a reversing gear by which the motion of the engine is reversed, the same as with marine steam engines. It is reversed while running, and requires no handling of the fly-wheel for reversal. It is made in sizes of f, 1, 2, 4, and 6 H. P. , with boat shaft and propeller complete. In Figs. 105 and 106 are illustrated the double-cylinder marine engines of this company. The eccentric on this engine operates the water pump and exploders for both cylinders, both for the forward and backward gear. The generator is a pipe with an open fitting containing an air-check valve and a needle valve for adjusting the gasoline injection. 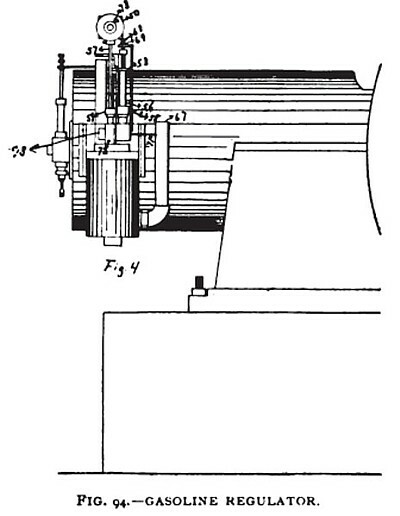 The generator pipe leads to each crank-shaft chamber, with a light check to each opening to prevent back draught from one cylinder to the other by the alternate strokes of the pistons. The down-stroke of the piston opens an exhaust port through the walls of the cylinder, and at the same time compresses the explosive mixture that has been drawn in at the previous up-stroke of the piston. A connection between the crank chamber and a valve chamber on top of the cylinder head allows the compressed air-and-vapor mixture to flow through a piston valve into the cylinder at the moment that the pressure is relieved by the exhaust. The return up-stroke compresses the gas mixture, which is exploded by the trip of the electric exploding-device. By a novel arrangement of sector and lever the engine is reversed. Another device for reversing the propeller wheel, made by this company, is a double concentric shaft with a sleeve and lever, by which the longitudinal shifting of the centre shaft causes the blades to turn for stopping or backing.